As promised yesterday, here's the small cluster of services west of the Mitchell Point Tunnel after the construction of the Mitchell Point Tour Inn. Now you've got all the photographic evidence. You can read about this apot in the excellent oral history of the Columbia River Highway prepared by ODOT here. Read pages 28-36, and you'll be fully ready for a visit to the spot, now the rest stop/ trailhead at the Mitchell Point exit from I-84 (only accessible eastbound). 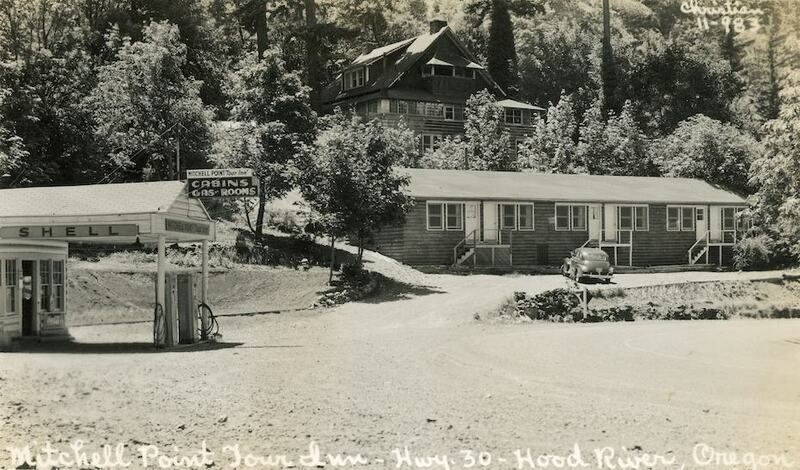 These are the motel cabins that I remember going to and from Portland when I was a child. Great series, Arthur! Thanks for all the work you do to keep our history alive! Motel concrete foundation remains as well as the two rock walls in the previous photo, one 4' behind the motel and one along the highway. Since the previous photo the service station has gained a peaked roof and the gravity gas pump has been replaced by electrics. I should have mentioned the last two photos are courtesy of our friends at ODOT. They've sent me a nice collection of images to share with you which I'll be rolling out over the next few months. The ODOT history document is a GREAT read and well done. Thanks so much Arthur for posting these, and for all of you that provide further illumination via your comments. I'm fascinated each and every day seeing more of the history of our area. What year is this photo? Thanks Arthur, Kenn and others who kept this history alive. It has been fascinating. I printed off a copy of the last three days and stuck it in the center console of the car. Can't wait to stop at the now empty, vacant Mitchell Point exit. Susan, we don't know the exact year of the image but the PDX Postcard History site says Clarence Christian had a Portland studio in the 1940s and 50's. This matched Charlott's recollections of this motel in that era. Mark Moore, pdxhistory, does a wonderful job with this web site....one should also take a look at the newsletters he does for the Webfooters Postcard Club. www.thewebfooters.com it is amazing at all the history that is contained on the "lowly" postcard. one of my favorites is in the January issue that is focused on Vancouver USA history showing a streetcar on the 1917 Interstate bridge over the Columbia.....yes, Vancouver, you had steel streetcar rails coming from Portland into your town back in 1917! !...….we are lucky to have some great historians in our community. Hope Arthur comes up with pictures of the Menominee Store just east of Mitchell, I have only seen and copied one. The RR had a Menominee siding east of Mitchell Point and Mitchell Point siding to the west. They were long ago joined into the present long Meno siding. The Mitchell Point Property belonged to my family. My father Joe Bill Tenney and his brother Jack Tenney were raised there. I saw the property when I was young and hike it often now. I live in Hood River so it is easy access. The Lausmans bought it from my family; the build of I84 people were told they had to sell their property to the state. There is mumbling going on about that to this day. Cliff Elliot told me of the book, "Swivel Chair Logger" The Life & Work of Anton A. "Tony" Lausmann. by Bert Webber. 'The entire park area, 126 acres, was a gift from the Columbia River Gorge Commission on Aug. 14, 1961. It was first a gift to the Gorge Commission from the Lausmann family on Dec. 28, 1954, as a memorial to Vinzenz Lausmann and to be used for park purposes.' The book is quite fascinating, especially early logging days within Hood River Co. I'm wondering if the Camp Yallani cabins (now gone) were originally from Gr. Point logging operations run by Lausmann. I know the cabins seemed very old even in the 60's when I went to camp there.